Warning: I am out of coffee. This will probably be much more disjointed and rambly than normal. Yesterday Softi, a longtime twitter friend of mine, and once upon a time WoW blogger went out of her way to set up an account based on US servers. I was (and still am) quite happily looking forward to hanging out a bit while in game. Seriously, I was just as happy as if one of my long lost classmates or perhaps one of the few old service buddies I still have, would have said they were coming to town. That got me to thinking a bit about what it means to be a friend. When you are talking about Johnny from down the road that you went to high school with, or Mary from the cubicle next to yours, even Willie from the service that you have not seen in a decade and you call them friends everyone knows what you are talking about. Society seems to say you can be friends with folks you rarely speak with and in some cases would not even invite to your home. There are people who go out of their way to set up pen-pals, friends who by their very nature will likely never meet, and that’s perfectly OK and acceptable. Why is it when I try explaining to someone who does not spend much time on-line how you can be friends with people you have never actually met I just get funny looks? How can it be normal to be friends with a pen pal in another country, and yet be somehow twisted and wrong to have met through playing a video game? We are still just writing words back and forth right? Why is it that people simply can’t understand that you can in fact become friends just chatting, Sitting up late, just hanging out in vent or typing back and forth? The Internet is a wonderful place, I have gotten to meet lots of interesting people I would likely never have met without it. The only downside is that while the earth has shrunk in terms of communication it is still a pretty big place as far as actually getting somewhere goes. Wouldn’t it be nice to be able to say, lets raid (insert instance here) tonight and then all get together for lunch tomorrow? How about getting a whole guild together for a cookout? In a few rare cases it has been known to happen. For example, a couple of guild mates were moving across the country a few years back. They stopped to visit folks in three or four towns along the way, including stopping in mine for a weekend of camping and other offline fun. I still have pictures of our kids playing together, it was rather surreal. I know from listening to the Double O podcast (which everyone should be doing) that Opheile took quite the road trip, during which she met up with her co-host Oestrus and much fun was had by both. I hear over and over about people meeting through online interaction, then meeting offline as well. My brother and his wife met that way years ago. I suppose the way I see it, a friend is a friend, no matter what media you happen to interact thru. Thirty years and a few months ago I watched the space shuttle Columbia liftoff off from it’s pad at the Kennedy Space Center from my house just across the Indian River. It was on every news cast, televisions were rolled into classrooms and the classes stopped while the children watched. Today the shuttle Atlantis cut through the early morning haze to make the final landing of the program. I watched it streamed live over the internet. Unfortunately it did not rate as even kind of important to the folks running the television networks. In order to find a decent live stream with decent commentary and without more time spent on commercials than content I ended up watching it through the BBC. We’ve come a long way in the last thirty years apparently. No once even seemed to notice that an era had ended today. Do you never cook it because of how much of a nuisance it is to make? Congratulations, we have something in common. Actually I should say we had something in common. Now, not so much. We can fix that though. After you try this recipe you will be making it all the time, and we will have lasagna in common again. This recipe takes all of about 15 minutes to put together and is done in just over an hour start to finish. It’s so easy that you don’t even need a measuring cup. It also freezes uncooked quite well, so you can spend the 15 minutes on the weekend and still have an awesome dinner in the middle of a hectic work week. 1 box (16 oz usually) of lasagna noodles. Not much of a shopping list is there. Well, on to the destructions. Take your pound of chicken Italian sausage and brown it while you are doing the next couple steps. Set it aside. As though you needed me to show you what browned sausage looks like. Grab yourself a bowl and mix the eggs, the ricotta cheese, and half of the mozzarella cheese. Set it aside. 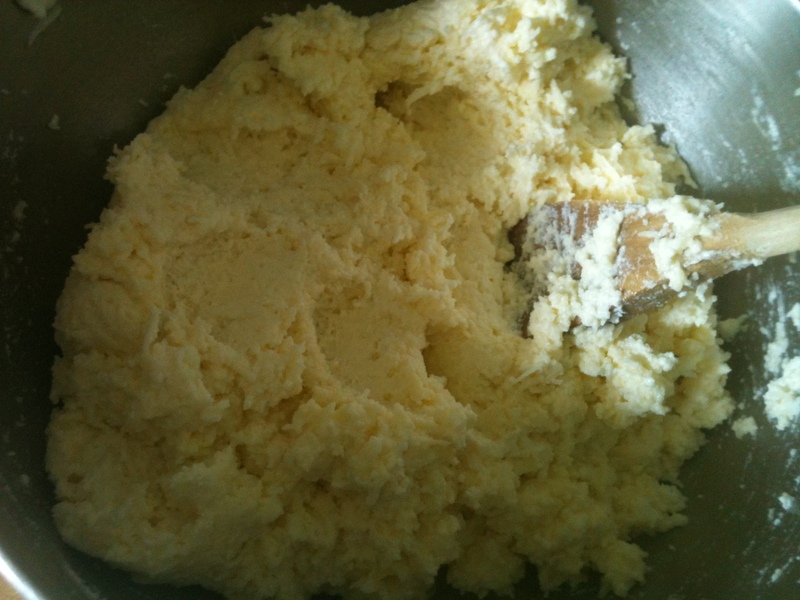 Your cheese and egg mixture should look something like this. 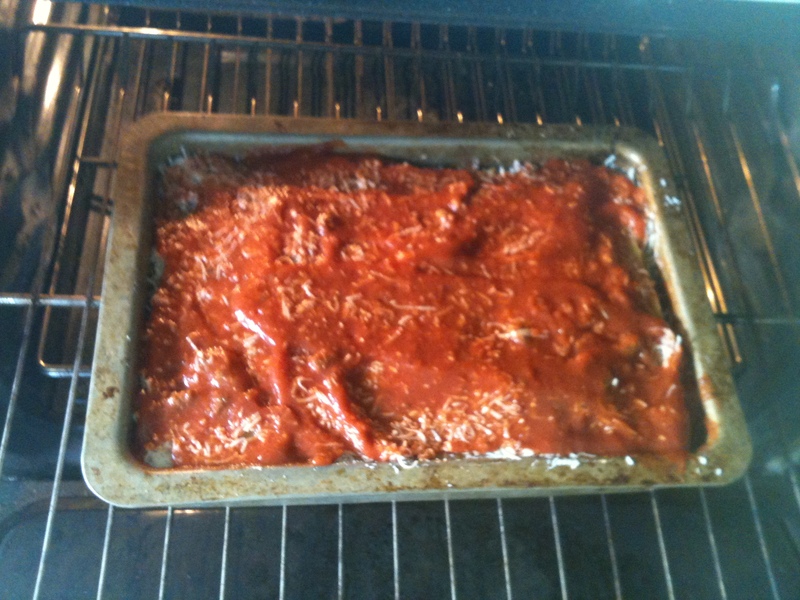 Take your 13 x 9 x 3 lasagna pan and spread about 2/5 of a can of pasta sauce in the bottom. Next we will start building our layers. 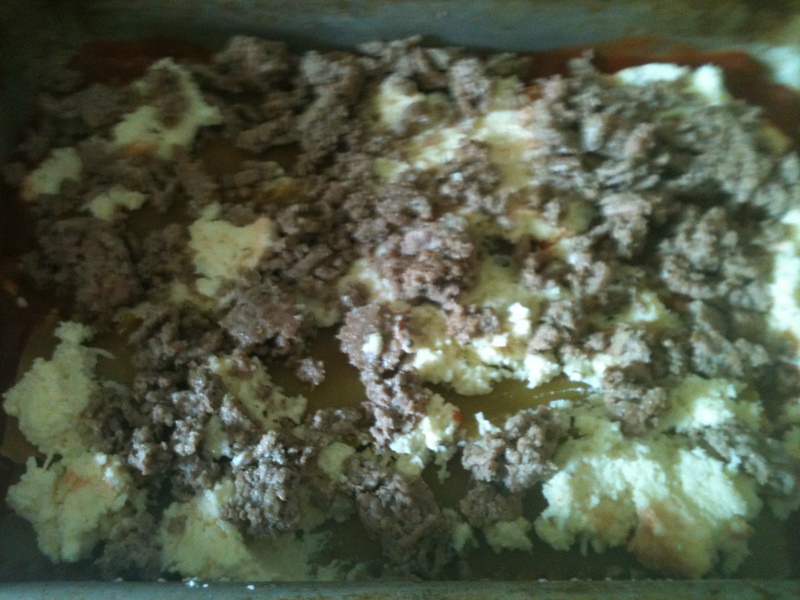 First layer (in order): 4 or 5 lasagna noodles, sufficient to cover the bottom of the pan, 1/3 of your cheese mixture, half of the meat, half of whats left of your mozzarella (about a cup), 2/5 can of sauce. 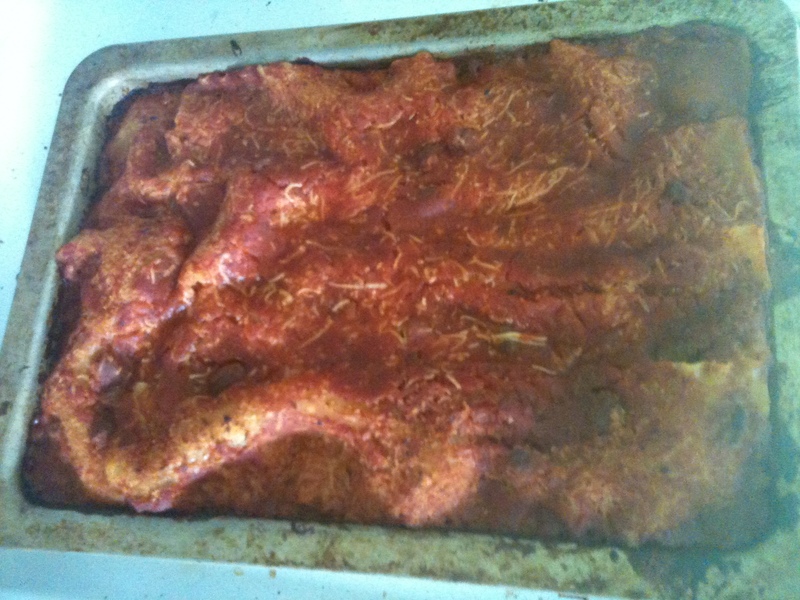 As you layer on the meat and cheese it will look something like this. Third layer (once again, in order): 4 or 5 lasagna noodles, sufficient to cover the pan, the last 1/3 of the cheese mixture, the rest of the meat, 2/5 cup of sauce. Fourth and last layer (in order): 4 or 5 lasagna noodles, sufficient to cover the pan, the last cup of the shredded cheese, the last 2/5 can of the sauce. There it is, all built. Cover with foil and bake for 50-60 minutes. Let rest for 15 minutes and serve. Mmmmm, yummy Lasagna goodness fresh from the oven. I really wish I had an app for posting what my kitchen smells like right now. Enjoy the looks of admiration and take the evening off since you slaved over a hot stove all afternoon making dinner. 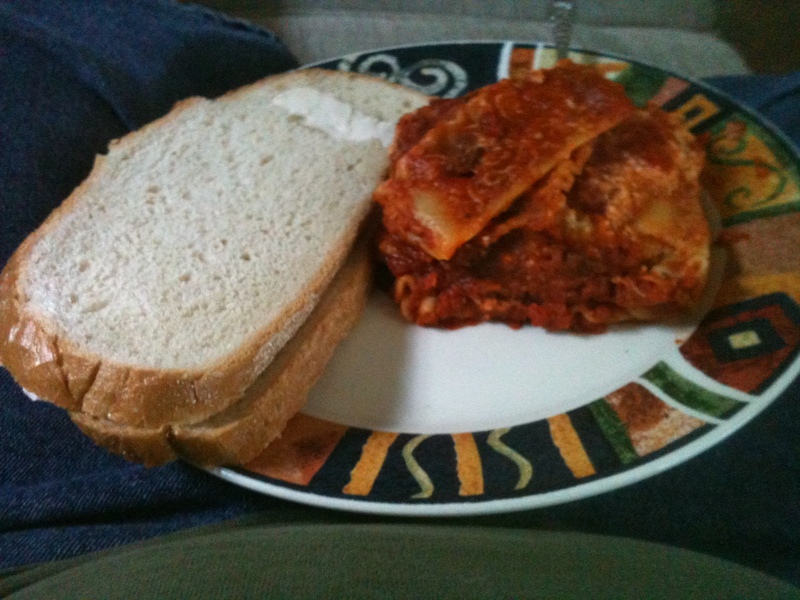 Man I love me a good lasagna. I should have been named Garfield. Ok, now the most awesome thing about this is it is not my way or the highway. So long as you keep the basic building blocks of noodles, cheese, and sauce, you can have a lot of fun playing with this one and making it your own. A friend of mine tweaked it to be a meatless lasagna by simply removing the sausage and going with more cheese. He added about 2 – 3 cups more shredded cheese and added spices to the cheese mixture to account for what was in the sausage. I have also swapped out the mozzarella for the 5 cheese Italian blend that they have at the grocery. 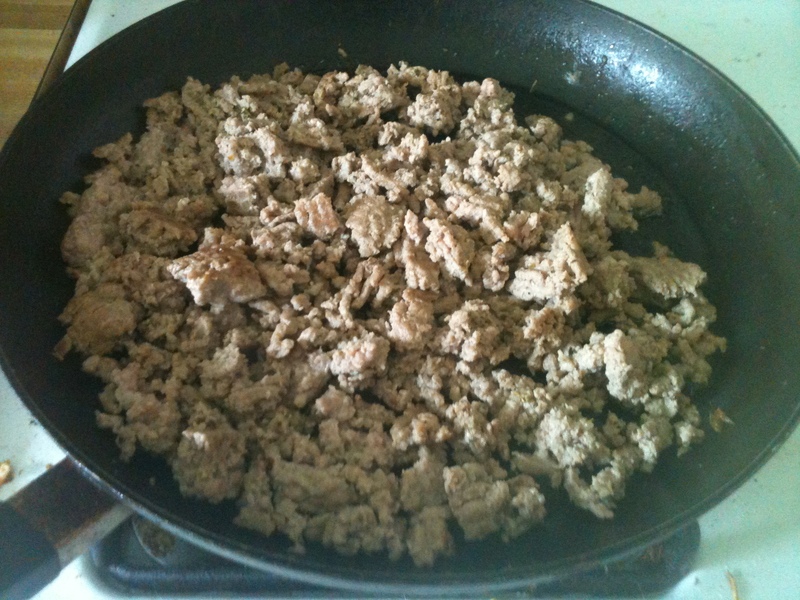 I’ve made it with regular ground turkey and added garlic and Italian seasoning. I have even made this in a dutch oven in the coals of a campfire. You want to see jealous friends? do this a few days into a campout when they are all living off hotdogs and beans in a can. Alrighty, enough for me for today. It’s not even breakfast and I am making myself hungry. Hey there folks, fine day for you to stop by. There is a tale that needs telling and a fire that needs tending. There are drinks in the cooler and brats on the grill. Relax a bit, and hear me out. A bit over three years ago there was a tragedy down in Florida. A day or two ago her mother, who had been tried for murdering her, was found not guilty. The interwebs, they are just humming with folks that want that womans head on a stick. Everywhere I turn there are folks losing their minds because they just know the mother killed her child. They are screaming to the rooftops about how she is guilty, and is getting away with murder. There are whole articles devoted to calling out the members of the jury as incompetent fools who “got it wrong”. Funny thing, people saying that who were not there. There is a difference, a very big difference, in finding someone “not guilty” and saying they are innocent. Not guilty simply means that their guilt was not proven, it does not mean it was never there. Why am I getting my undies in a wad over this? A few years ago there was a letter in my mail box. Figuring I would be in and out after a day or three, I informed my employer and reported for my duty. Turns out I was there for a while. The case involved a boy of about nineteen years of age and a girl of about seventeen. There were also parents and at least one off duty police officer involved. I won’t go into the details, as the jury was asked to hold them confidential. I will however say that no one in this case was deceased. Suffice it to say that the boy was looking at doing some hard time, measured in decades. We sat there in our little box for a good long time. There was testimony from both sides, from police, from experts. There was a lot to hear, simply because no one thing was damning. The attorneys for both sides were quite passionate, and gave well reasoned presentations of what they believed the series of events was. Of course, other than one or two points that both sides agreed on (gravity was still in effect throughout for instance) the stories differed wildly. We sat in our box and took it all in. After the days of testimony were complete, and both sides rested their cases, the judge addressed us. We were told to go decide amongst ourselves, based solely on the evidence presented, whether the young man was guilty beyond a reasonable doubt. We were not asked to determine whether we thought he committed a crime, but whether the prosecution had proved it to that standard. Just before Noon the twelve of us went into the jury room and went about electing a foreman, which was not me. The first thing he asked for was a vote. Makes sense, if we are all in agreement then why spend the afternoon chatting about it. After all, we all had lives waiting for us to get back to them, chores that needed done, familys that needed tended to, football that needed to be watched. We passed in our post it notes and the foremen checked them. Eleven said guilty, one said not guilty. He announced the results, and at the behest of several others called for another vote. Just in case the lone dissenter had changed their mind. Once again, eleven came back guilty. The last one this time said “Not guilty, lets order lunch, we’re gonna be here a while”. As he looked up from the slips I broke the silence and said “Pizza sounds good”. We even got bread sticks. One of which was skinny and horribly overcooked, like a french fry that has made two trips through the oil. As I recall I ended up using as a pointer for most of the day. We started at the beginning, looking over the case as presented by both sides. Comparing, contrasting, seeing where the actual evidence (of which there was painfully little) would take us. Mostly in very foggy circles. Dinner was Chinese, and by then the vote was six to six. As we went and looked through the case things struck us. Things that just didn’t quite fit the way either side was telling the tale. There were some harsh words back and forth in that jury room. I may have even said a few. In the end the vote came back unanimously. There is a big difference between innocent and not guilty. All of us believed that the boy was guilty as charged. Our legal system though is not based on what we feel is right. It’s on what can be proven. It’s based on the idea that we would rather let a guilty man walk free than risk putting an innocent man in jail. We got it right, and in my opinion so did the jurors in a certain high profile murder case down south. Doesn’t mean I feel good about the verdict we rendered, or that the jurors down there do either. To this day I am pretty damn sure I was instrumental in letting a guilty man walk. What it means is that we did our jobs as the last line of defense against jailing someone for a crime that the state could not prove they committed. The same consideration I pray I would receive if I ever stood in court accused of a crime. Well, folks. I told you I’d spin a tale for you. This one left a bad taste in my mouth. Someone grab me a brew and a brat, I have to go put another log on the fire. Just under a year ago I was given a superawesome gift. I was given a boat. For the rest of the fall I tinkered with her, finally winterizing and putting her in storage last October. Over the course of the winter and spring I have gathered just about everything I can think of to finish getting her ready to sail. Yes, I am excited about it. There is only one thing that I am missing. I have been racking my brains for the last year and have not come up with anything decent that would also fit in the fairly small space I have to paint it. So I figured, when all esle fails, ask the internet. I do a lot of reading. To those that know me this should come as no surprise. Recently I have read a series of articles that complained about businesses losing customers because of that business (or it’s owner) supporting a political or social cause. The authors have decried the injustice of this as an infringement on the freedom of speech. As an attempt to silence the voice of the business by starving it of customers. I don’t see it that way. I see it as a validation of the freedom of speech. The business has a right to support whomever or whatever candidates or causes it wishes to, just like it has the right to decide what products to sell or services to offer. The customer has a right to choose whether to support that business or not by purchasing its products or services. A wise man once said, for every action there is an equal, and opposite, reaction. Essentially, for every action there is a price. Here, I’ll give a few quick examples. Many moons ago, when my wife and I were both 19 years old, we got married. After the wedding we showed up at the Holiday Inn here in town where I had booked a room for the evening. When I tried to check us in I was informed that since neither of us was yet 21 they would not let us have the room I had reserved. I stood there, in my dress whites, next to my wife who was still in her wedding dress, and was told we were not old enough to do business with them. They literally told us to leave and go get one of our parents. We left alright. Left and never came back. Twenty two years later I have yet to stay at another Holiday Inn or affiliated hotel. I will drive miles out of my way to avoid them. I’ll go to my grave never giving them one red cent of my money. If I go to a business and have a horrible customer service experience? Likely I won’t go back, as I said, I haven’t. Push my Jeep 20 miles down the road? That cost a gallon of gas. Supply a service your clients like? You will find happy clients that will continue to use your services. Forget to pay your utility bills? Hope it’s not winter time, because they shut you off. Support a cause your clients disapprove of? You will likely lose some clients. Just like anything else in life free speech does not exist in a vacuum. Your words and actions carry meaning, and when taking sides on any issue you will always be alienating some who disagree with you. Just remember that when you decide how you want to go about exercising your rights. It is said that freedom isn’t free. Free speech isn’t free either. Why hello, what brings you here? Picture yourself sitting at a campfire. The crickets are chirping. The wind is calm. The smoke of the fire is gathered about, keeping the bugs at bay. The light of the fire is gently dancing on the features of the friends that have gathered to enjoy the evening. Thats what this place is. This is my campfire, about which I will tell stories. Like any camp I have ever been to some of the tales will be good, others bad. Some funny, some not so much. I would like to invite you all to join me by the fire. Some of you know me as Dechion, once upon a time the author of Dechions Place, A wildly popular blog about the video game World of Warcraft. Well, ok, wildly popular as compared to having red-hot bamboo slivers shoved under ones fingernails. It’s all about the comparison right? Some of you know me as Brad. Some of you don’t know me at all, but we can fix that. Either way, welcome to my new place. We’re all friends here. Grab a beverage and pull up a log. I have tales to tell.